Evidence that Cbl proteins have functions regulating PTKs initially came from genetic studies in C. elegans . Figure 1 c-Cbl interacts with many signaling proteins. 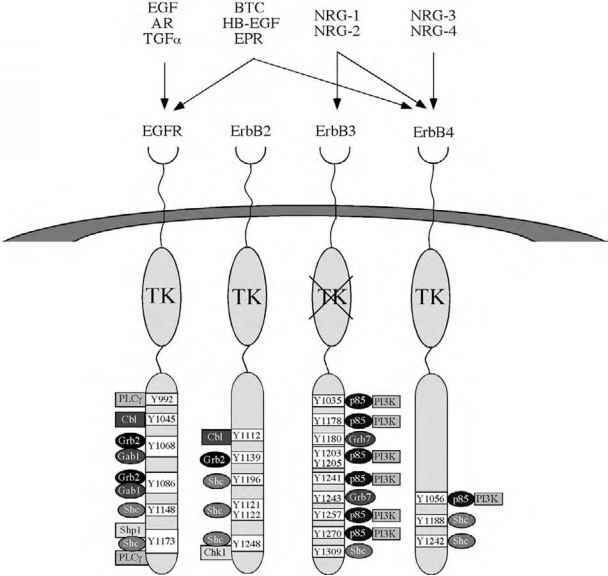 Some of these interactions occur after the activation of PTKs which results in recruitment of c-Cbl to receptor complexes and the targeting of phosphorylated tyrosines on PTKs by the TKB domain. 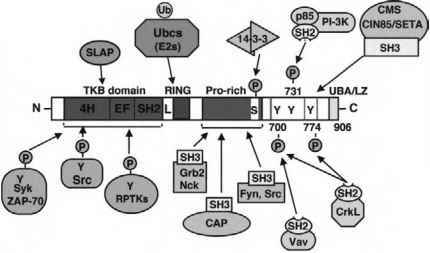 This enables PTKs to be downregulated by c-Cbl-associated proteins such as E2 ubiquitin-conjugating enzymes recruited by the RING finger and linker (L) domains and CIN85, which is recruited by proline and phosphotyrosine motifs and is involved in mediating RPTK internalization. c-Cbl phosphorylation on tyrosine (Y) and serine (S) residues promotes associations with many SH2-containing proteins and 14-3-3 proteins, respectively. Some associations are constitutive, such as those with SH3-containing proteins that bind one or more of the 15 potential SH3-binding proline motifs within the C-terminal half of c-Cbl. Loss-of-function mutations in Sli-1 restored signaling for vulval induction and survival through a weakly active epidermal growth factor receptor (EGFR) homolog LET-23, whereas introducing additional copies of Sli-1 suppressed vulval induction. These experiments indicated that Sli-1 is a negative regulator of LET-23 that functions upstream of LET-60/Ras. Studies in Drosophila also suggest that Cbl can negatively regulate RPTK signaling: D-Cbl suppresses the development of R7 photoreceptor cells in flies on a sensitized genetic background  and functions as a negative regulator of a dose-sensitive EGFR pathway involved in dorsoventral patterning during oogenesis .